DC Comics’ THE BRAVE AND THE BOLD began in 1955 as an adventure anthology featuring such literary styled heroes as Robin Hood, Viking Prince and the Silent Knight. From #25 (Sept. 1959) through #49, B&B was a tryout comic ala SHOWCASE, introducing such series as Suicide Squad, the Silver Age Hawkman and most successfully, the Justice League of America. But with #50, the title introduced the concept of the one-on-one superhero team-up book, something that would become a staple of comics through the 1980s. Originally pairing seemingly random characters from the DC Universe (picked out of a hat? 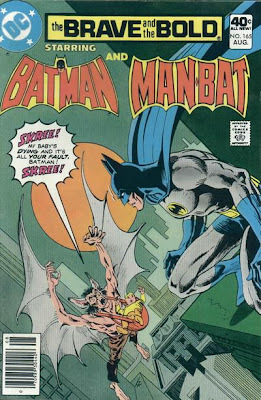 ), by #67, the book became a Batman team-up book (with the exception of a handful of issues). What made the book so interesting is that Batman, as a rule, works better as a loner. There are certain denizens of the DCU that work well with the dark night detective: the avenging spirit, Deadman; Steve Ditko's The Creeper; Green Arrow; Wildcat. 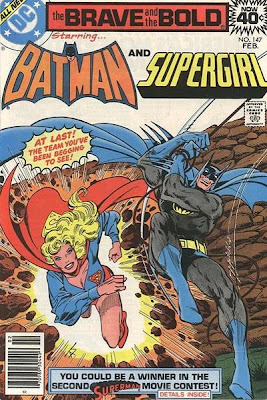 But some of the more memorable issues of B&B were ones that paired Batman with some rather incompatible heroes: The sci-fi hero, Adam Strange; Jack Kirby’s Mister Miracle; the postapocalyptic Kamandi; Supergirl; and Lois Lane. The vast majority of these stories were written by Bob Haney, a longtime comic scribe who had a hard time adjusting to comics’ increasing emphasis on continuity and verisimilitude. Some seriously goofy Batman stories took place within the confines of B&B. The irony is, they were usually drawn by two of the most evocative Batman artists of the era: The first Batman stories illustrated by Neal Adams took place in B&B in the late 1960s (Batman entering The House of Mystery was a particular treat). He did more covers than interiors, however, and this awesome face to B&B #89 (May 1970) featuring the Phantom Stranger may be my favorite of them all. 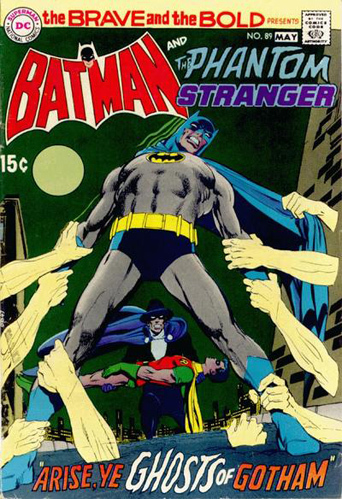 In issue #98, the Phantom Stranger returned to team with Batman in a story drawn by the former’s regular artist, Jim Aparo. Aparo almost immediately became one of DC’s go-to artists for the Caped Crusader. 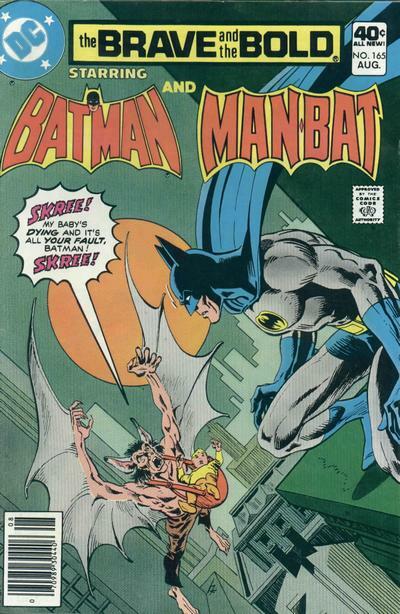 Aparo took Adams’ realistic style and gave it a gritty edge, so visceral you could practically smell the garbage in the Gotham alleys and Commissioner Gordon’s omnipresent pipe. 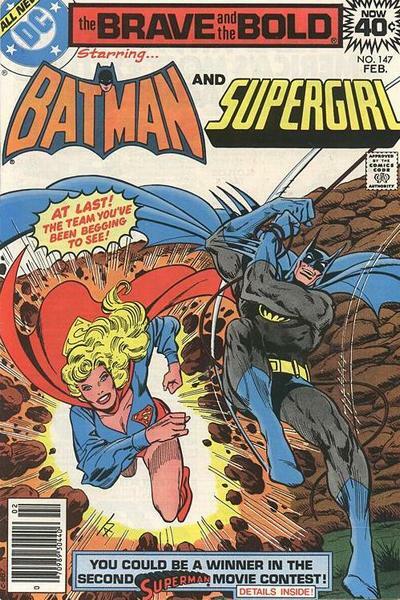 Aparo penciled almost every issue of BRAVE AND THE BOLD from #104 through its cancellation with #200 in 1983. 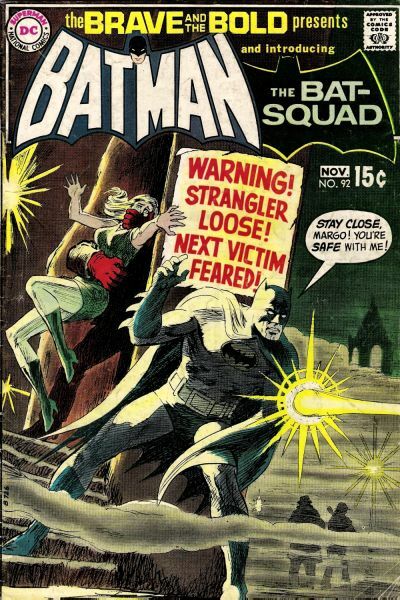 Here’s Aparo’s cover to B&B #108 (Sept. 1973), a pairing with Sgt. 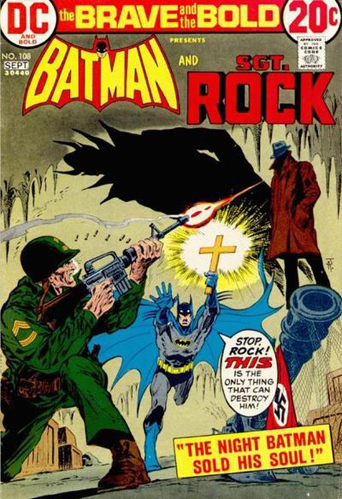 Rock in a tale combining Nazis, the Devil and religion (a recurring theme for Haney). Could this cover pass muster today? Probably not, and while personally I’m not wild about a religious Batman, it’s a powerful image nonetheless.